Joan Mitchell (February 12, 1925 – October 30, 1992) was an American "second generation" abstract expressionist painter and printmaker. 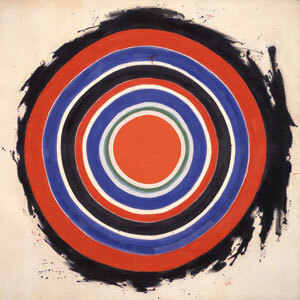 She was a member of the American abstract expressionist movement, even though much of her career took place in France. Along with Lee Krasner, Grace Hartigan, Helen Frankenthaler, Shirley Jaffe, Elaine de Kooning, and Sonia Gechtoff, she was one of her era's few female painters to gain critical and public acclaim. Her paintings and editioned prints can be seen in major museums and collections across the United States and Europe. Lenore "Lee" Krasner was an American abstract expressionist painter, with a strong speciality in collage, who was married to Jackson Pollock. This somewhat overshadowed her contribution at the time, though there was much cross-pollination between their two styles. Krasner’s training, influenced by George Bridgman and Hans Hofmann, was the more formalized, especially in the depiction of human anatomy, and this enriched Pollock’s more intuitive and unstructured output. Grace Hartigan was a second-generation American Abstract Expressionist painter and a member of the New York School. Mitchell was born in Chicago, Illinois, the daughter of dermatologist James Herbert Mitchell and poet Marion Strobel Mitchell. :21  She enjoyed diving and skating growing up, and her art would later reflect this athleticism; one gallery owner commented that Mitchell "approached painting almost like a competitive sport". 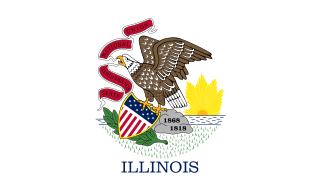 Mitchell frequently attended Saturday art classes at the Art Institute and eventually would spend her summers of later adolescence in a Chicago Art Institute run art colony, Ox-Bow. She lived on Chestnut Street in the Streeterville neighborhood and attended high school at Francis W. Parker School in the Lincoln Park neighborhood. Mitchell studied at Smith College in Massachusetts and The Art Institute of Chicago,  where she earned her BFA in 1947 and her MFA in 1950. After moving to Manhattan in 1947, she wanted to study at Hans Hofmann's school in New York but, according to Jane Livingston in her 2002 essay ("The Paintings of Joan Mitchell"), Mitchell attended only one class and declared, "I couldn't understand a word he said so I left, terrified." A $2,000 travel fellowship allowed her to study in Paris and Provence in 1948—49,  and she also traveled in Spain and Italy. A Bachelor of Fine Arts is the standard undergraduate degree for students in the United States and Canada seeking a professional education in the visual or performing arts. Paul Cézanne was a French artist and Post-Impressionist painter whose work laid the foundations of the transition from the 19th-century conception of artistic endeavor to a new and radically different world of art in the 20th century. Cézanne's often repetitive, exploratory brushstrokes are highly characteristic and clearly recognizable. He used planes of colour and small brushstrokes that build up to form complex fields. The paintings convey Cézanne's intense study of his subjects. Wheatfield with Crows is a July 1890 painting by Vincent van Gogh. 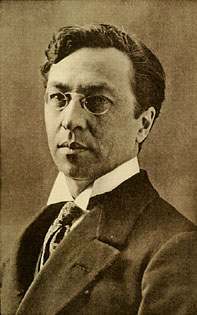 It has been cited by several critics as one of his greatest works. Mitchell said that she wanted her paintings "to convey the feeling of the dying sunflower" and "some of them come out like young girls, very coy ... they're very human." Mitchell was very influenced by her feelings and incorporated it into her artwork. She even compared these feelings that influenced her paintings to poetry. Some would even compare it to lyric poetry, according to the essay The Lyrical Principle: On JoanMitchell by Dore Ashton. Jean-Paul Riopelle, was a painter and sculptor from Quebec, Canada. He became the first Canadian painter to attain widespread international recognition. Richard Diebenkorn was an American painter and printmaker. His early work is associated with abstract expressionism and the Bay Area Figurative Movement of the 1950s and 1960s. In the late 1960s he began his extensive series of geometric, lyrical abstract paintings. Known as the Ocean Park paintings, these paintings were instrumental to his achievement of worldwide acclaim. Fuller Potter was an American Abstract expressionist artist. He was born in New York City in 1910, attended St. Bernard's School in New York and Groton School in Groton, Massachusetts, and lived most of his life in his Ledyard, Connecticut estate, near Old Mystic. Potter started painting in the traditional modes of representation, specializing in still life and landscape. His work was shown in New York in the 1930s at the Marie Harriman Gallery. Nancy Graves was an American sculptor, painter, printmaker, and sometime-filmmaker known for her focus on natural phenomena like camels or maps of the moon. Her works are included in many public collections, including those of the National Gallery of Art, the Brooklyn Museum of Art, the Smithsonian American Art Museum, the National Gallery of Australia (Canberra), Walker Art Center (Minneapolis), and the Museum of Fine Arts. When Graves was just 29, she was given a solo exhibition at the Whitney Museum of American Art. At the time she was the youngest artist, and fifth woman to achieve this honor. Ronnie Landfield is an American abstract painter. During his early career from the mid-1960s through the 1970s his paintings were associated with Lyrical Abstraction,, and he was represented by the David Whitney Gallery and the André Emmerich Gallery. Norman Bluhm, was an American painter classified as an abstract expressionist, and as an action painter. Mary Frank is an English visual artist known primarily as a sculptor, painter, printmaker, draftswoman, and illustrator. Anne Ryan (1889–1954) belonged to the early generation of New York School Abstract Expressionist artists. Her first contact with the New York Avant-garde came in 1941 when she joined the Atelier 17, a famous printmaking workshop that the British artist Stanley William Hayter had established in Paris in the 1930s and then brought to New York when France fell to the Nazis. The great turning point in Anne Ryan's development occurred after the war, in 1948. She was 57 years old when she saw the collages of Kurt Schwitters at the Rose Fried Gallery, in New York City, in 1948. She right away dedicated herself to this newly discovered medium. Since Anne Ryan was a poet, according to Deborah Solomon, in Kurt Schwitters’s collages “she recognized the visual equivalent of her sonnets – discrete images packed together in an extremely compressed space.” When six years later Anne Ryan died, her work in this medium numbered over 400 pieces. Pierre Matisse was a French born American art dealer active in New York City. He was the youngest child of French painter Henri Matisse. Nicolas Carone belonged to the early generation of New York School Abstract Expressionist artists. Their artistic innovation by the 1950s had been recognized internationally, including in London and Paris. New York School Abstract Expressionism, represented by Jackson Pollock, Willem de Kooning, Franz Kline, Conrad Marca-Relli and others, became a leading art movement of the postwar era. Joan Snyder,, is an American painter from New York. She is a MacArthur Fellow, a Guggenheim Fellow, and a National Endowment for the Arts Fellow. Perle Fine (1905–1988) was an American Abstract Expressionist painter. Fine was most known by her combination of fluid and brushy rendering of the materials and her use of biomorphic forms encased and intertwined with irregular geometric shapes. Richard Irving Bowman (1918–2001) was an abstract painter who worked primarily in the San Francisco Bay Area. He painted in an idiosyncratic style inspired by transcendental visions of nature, exposure to surrealism and investigations into sub-atomic physics. He is considered one of the first fine artists to employ fluorescent paint, which he maintained embodied sub-atomic life energy, beginning in the early 1950s. Amaranth Roslyn Ehrenhalt is an American painter, sculptor, and writer, who spent the majority of her career living and working in Paris, France. Ehrenhalt is one of the few abstract expressionists from the New York School of the 1950s who is still active today. She now lives and works in New York City. Hollis Jeffcoat is an American "third generation" abstract expressionist painter. Bill Scott is a contemporary abstract painter and printmaker who works and lives in Philadelphia. Beginning in 2004 Scott has been represented by Hollis Taggart Galleries where he has had seven solo exhibitions. ↑ Birmingham Museum of Art (2010). Birmingham Museum of Art: A Guide to the Collection. London: Giles. p. 243. ISBN 978-1-904832-77-5. Archived from the original on 2011-09-10. Retrieved 2011-06-24. 1 2 3 4 5 6 7 8 Albers, Patricia (2011). Joan Mitchell: Lady Painter. New York: Alfred A. Knopf. ISBN 9780375414374. 1 2 3 Suzanne Muchnic (June 12, 2011), Book Review: 'Joan Mitchell: Lady Painter' by Patricia Albers Los Angeles Times . 1 2 "She's About to Be the Belle of Basel, Decades After Her Death". Bloomberg.com. 2018-06-08. Retrieved 2018-06-08. ↑ Joan Mitchell Crystal Bridges Museum of American Art, Bentonville. ↑ Joan Mitchell: A Painter Under the Influences Los Angeles Times , April 26, 1994. ↑ Livingston, Jane; Mitchell, Joan; Nochlin, Linda; Lee, Yvette Y; Whitney Museum of American Art (2002-01-01). The paintings of Joan Mitchell. New York; Berkeley, CA: Whitney Museum ; University of California Press. 1 2 "Joan Mitchell", with Cora Cohen and Betsy Sussler, Bomb magazine, 17/Fall 1986. Retrieved October 24, 2012. ↑ exhibit-e.com. "Joan Mitchell - Exhibitions - Cheim Read". www.cheimread.com. Retrieved 2018-06-08. ↑ Nochlin, Linda (2002). "Joan Mitchell: A Rage to Paint". In Livingston, Jane. The Paintings of Joan Mitchell. New York: Whitney Museum of American Art. p. 49. ISBN 0520235703. ↑ Nochlin, Linda (2002). "Joan Mitchell: A Rage to Paint". In Livingston, Jane. The Paintings of Joan Mitchell. New York: Whitney Museum of American Art. p. 55. ISBN 0520235703. ↑ Ashton, Dore (Fall 2008). 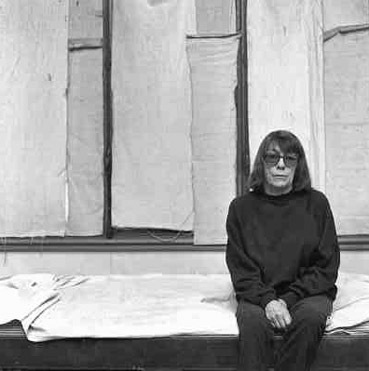 "The Lyrical Principle: On Joan Mitchell". Essay: 17 – via Academic Search Premier. ↑ Szalai, Jennifer (2018-09-26). "'Ninth Street Women' Shines a Welcome New Light on New York's Postwar Art Scene". The New York Times. ISSN 0362-4331 . Retrieved 2019-02-15. ↑ Livingston, Jane (2002). The Paintings of Joan Mitchell. Berkeley and Los Angeles, California: University of California Press. p. 21. ISBN 0-520-23568-1. ↑ Sandler, Irving (October 1957). "Mitchell paints a picture". ARTnews. 56 (6): 44–47, 67–70. Retrieved November 23, 2012. ↑ Bernstock, Judith (1988). Joan Mitchell. Hudson Hills Press in association with the Herbert F. Johnson Museum of Art, Cornell University. ISBN 0933920814. 1 2 3 "Bio". Joan Mitchell Foundation. Retrieved November 23, 2012. ↑ Brenson, Michael (November 3, 1989). "Review/Art; An Art of Motion: Joan Mitchell's Abstract Expressionism". The New York Times. Retrieved November 23, 2012. ↑ Russell, John (April 12, 1991). "Paintings That Liberate the Viewer's Imagination". The New York Times. Retrieved November 23, 2012. 1 2 Joan Mitchell: The Last Decade, November 13 – December 23, 2010 Gagosian Gallery, Los Angeles. ↑ "Empire State Plaza Art Collection". ↑ Rothfuss, Joan and Elizabeth Carpenter (2005). Bits & Pieces Put Together to Present a Semblance of a Whole: Walker Art Center Collections. Walker Art Center. pp. 392–393. ISBN 0-935640-78-9. 1 2 Ellen Gamerman and Mary M. Lane (April 18, 2013), Women on the Verge Wall Street Journal . ↑ Foundation, Joan Mitchell. "Joan Mitchell Foundation » Artist Programs » Artist Grants". joanmitchellfoundation.org. Retrieved 2018-01-17. ↑ Painters and Sculptors Grant Program Recipients Joan Mitchell Foundation. ↑ "Ann Purcell – Paintings from the 1970s" . Retrieved 15 January 2017. ↑ "Atlanta artist Michi Meko's work is "the contemporary experience of black life and survival"". Atlanta Magazine. 28 February 2018. Retrieved 21 April 2018. ↑ "Programs". Joan Mitchell Foundation. Retrieved 18 November 2015. ↑ Joan Mitchell, Untitiled (1960) Christie's New York, Post-War & Contemporary Evening Sale, 13 May 2014. 1 2 Joan Mitchell, Ste. Hilaire (1957) Christie's Post War and Contemporary Art Evening Sale, 13 November 2007, New York. 1 2 Hilarie M. Sheets (July 17, 2008), Artist Dossier: Joan Mitchell Art+Auction . ↑ Katya Kazakina (August 6, 2013), Top 20 Female Artists Fetch $1.8 Billion; Mitchell Leads Bloomberg . ↑ "Sale 2847 Lot 32". Archived from the original on 2014-05-14. Retrieved 2014-05-14. ↑ Crow, Kelly. "Christie's Art Sale Brings In Record $745 Million". Wall Street Journal . ↑ Kazakina, Katya. "Billionaires Help Christie's to Record $745 Million Sale". Bloomberg News . Archived from the original on 14 May 2014. 1 2 David Pagel (November 19, 2010), Art Review: 'Joan Mitchell/The Last Decade' at Gagosian Gallery Los Angeles Times . ↑ "Joan Mitchell Becomes the Sunflower". The New York Sun. Retrieved 2018-06-08. ↑ Joan Mitchell, Aires Pour Marion (1975–76) Christie's New York, Post-War & Contemporary Evening Sale, 13 May 2014. ↑ Kertess, Klaus (June 16, 2002). "Her Passion Was Abstract but No Less Combustible". The New York Times. Retrieved November 23, 2012. ↑ Kimmelman, Michael (September 20, 1992). "The Many Moods Of Henri Matisse". The New York Times. Retrieved November 23, 2012. 1 2 3 Livingston, Jane (2002). The Paintings of Joan Mitchell. New York, Berkeley, CA: Whitney Museum, University of California Press. ISBN 0520235681.